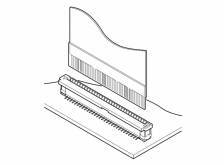 The FAZ series Zero Insertion Force (ZIF) connector has been developed as an SMT version of the existing FMZ connector. A ZIF mechanism improves wear resistance and extends the mating life of the connector. By moving the slider into it's locking position after the FFC has been inserted into the connector, the FFC leads are securely locked in place. Due to it's small pitch and it's ability to be surface mounted, this connector meets today's demand for high-density packaging. Top entry and side entry versions are available. Top entry is available with either an in-line or a staggered solder tail footprint whilst the side entry version is available with FFC contact points on either the upper or lower sides. 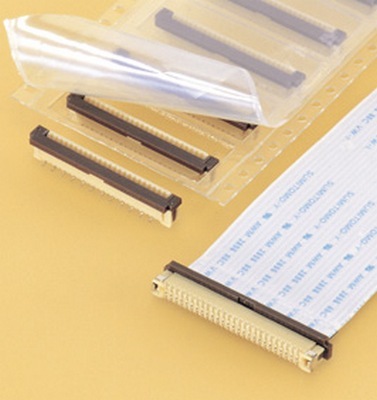 This connector is supplied in embossed tape packaging, for mounting by automatic placement machines.